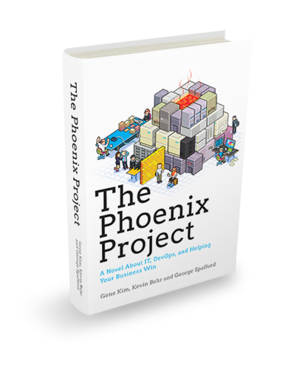 The Phoenix Project – 5 reasons why you should read it! First of all, I won’t pretend that I’m able to judge the book’s literary quality as English is not my mother tongue. But the read is really gripping and absorbing and it’s quite hard to stop reading it, you want to devour it! The authors managed to find the right tone and the right pace to tell an 300-ish pages IT story, which is a performance in itself! Well, almost :-) Even if this novel is a fiction the story sounds pretty real. It tells things that will certainly resonate with you if you’ve been involved in an IT project. Whether you are a developer, a project leader, part of the operation team, member of the compliance department, the security guy or even the CEO, it will certainly remind your own past experiences. As far as I know, it’s the only one of its kind. I’ve read Commitment by Olav Maassen, Chris Matts and Chris Geary but it’s a picture novel (and by the way, go get your copy if you haven’t read it yet!). There’s also The Goal by Eliyahu Goldratt and The Gold Mine by Freddy and Michael Ballé but even if I did not read them (yet!) they seem both more business oriented (correct me if I’m wrong!). If you’re in the situation the main character is facing at the beginning of the book, then you will obviously have some ideas to get things better. Some of you might realize that your fate is not fixed and that there are other way to work, more efficiently! As the story goes on, you might learn about new things. You’ll discover the power of DevOps and Continuous Delivery just to name a few. You’ll find out what the Value Stream is all about and how to increase its efficiency. What Lean can bring you.